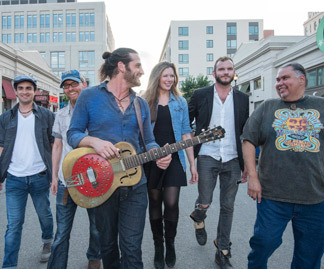 Adam Ezra Group’s songwriting is making waves around the country. The co-write, “Let Your Hair Down” with producers Shep Goodman and Aaron Accetta, (American Authors), just received “Song of the Year” at the New England Music Awards. A songwriting partnership with the legendary John Oates is taking Ezra back and forth between Nashville and tour. The theme song, “Grow Your Own Way,” was central to Midwest insurance giant, Country Financial’s 2014/15 marketing campaign. In addition, Adam Ezra’s debut efforts in movie scoring have lead to an appearance at the 2016 Tribeca Film Festival and the release of Adam Ezra Group’s new album, aptly titled, "Songs for a Movie." A tireless touring outfit, the Adam Ezra Group (AEG) played upwards of 200 shows in 2015, often devoting their time to local charities and always going out of their way to connect with fans. The Group is made up of lead singer, songwriter and guitarist, Adam Ezra, Alex Martin on drums, Turtle on percussion, Corinna Smith on fiddle, Francis Hickey on bass and Josh Gold on keys. Together they are creating a powerful, inclusive community around AEG shows that is beginning to be compared to a social-movement as much as a traditional music fan-base. It’s this dedication to fans that inspired the 2016 “Get Folked Concert Tour” in which Ezra ventured solo/acoustic to the homes of 30 fans in as many days and almost as many states to play house concerts throughout the entire month of January.